Our plan was to visit Glendalough and Powerscourt on the same day, my concern was timing and being unable to fit both in. No problems though, all worked well, we had ample time to explore and get a flavour of each of these wonderful places. It only took half an hour to drive from one to the other, an early start at Glendalough meant time for a late lunch at Powerscourt and the whole afternoon to check out the gardens and waterfall. 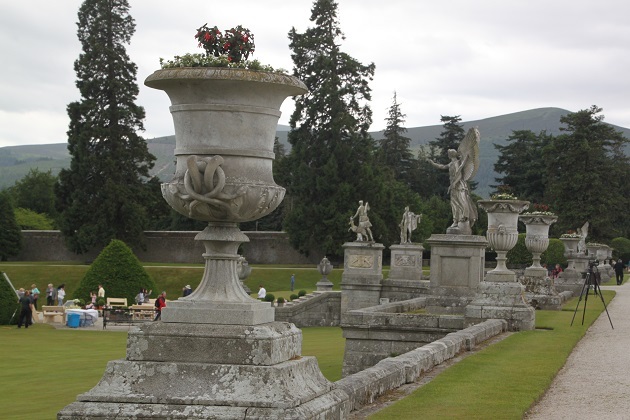 Ireland has some fabulous gardens, Wicklow makes a notable contribution to this boast with the gorgeous gardens being the main attraction at Powerscourt. They took two decades to create in the time of the Victorians, stretch over 45 acres and are a glorious blend of formal gardens, sweeping terraces, ornamental lakes and secret hollows. 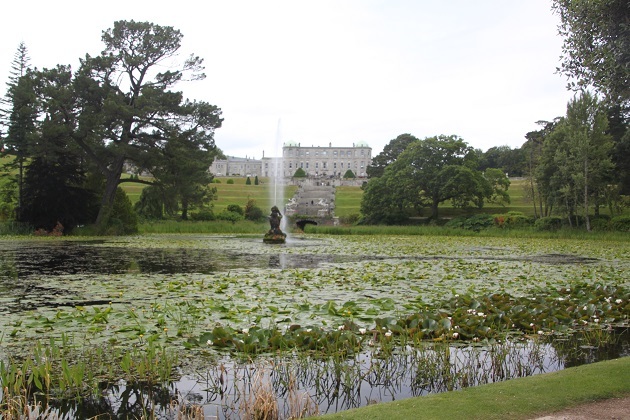 The whole Powerscourt Estate set in the Wicklow Mountains is very impressive. It was once a castle, then they turned it into a magnificent mansion between 1731 and 1741. A fire badly destroyed the building in the 1970’s but it was renovated and restored in the 1990’s. The house is now a whole series of shops and a luxury hotel – bit of a shame in my opinion but it certainly draws the tourists. Incredibly busy when we pulled into the car park there were tour buses galore and barely a parking spot to be had. We braved all that, headed inside first for refreshments at the Avoca cafe and then a peek in the shops. I couldn’t resist, Husband and Son were not so keen but in the end it was them who left with purchases. I was empty handed. 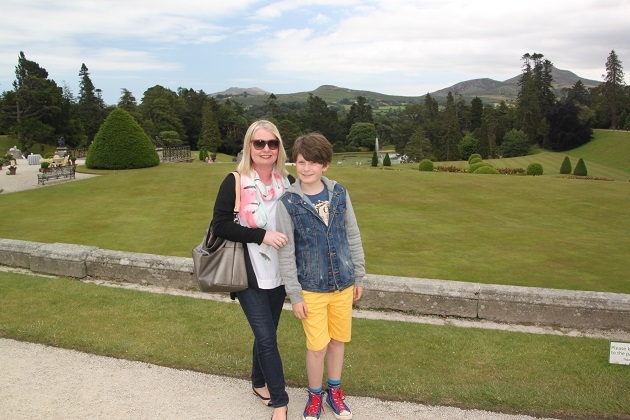 The gardens though were the real reason we had come to Powerscourt. Strangely despite all the crowds in the car park and shops the gardens were blissfully empty – I didn’t get that but I wasn’t complaining. It was nice to wander and have the place almost to ourselves. The map at the entrance had a walking trail that seemed to take in most of the gardens, we decided that would be our plan for exploring. It worked very well, allowed us to see everything and was highly informative. Our walk took about 1.5 hours – we didn’t rush. Just outside the mansion are the Italian Gardens and the most spectacular view. I loved it – the landscaping is great but it is that view beyond to Sugar Loaf Mountain that just takes your breath away. Supposedly one of the best views in Ireland, I would not argue with that. Son loved the pair of life sized winged horses on the lake, apparently they form part of the family coat of arms. The fountain on the lake is spectacular too – based on the Piazza Barberini in Rome. 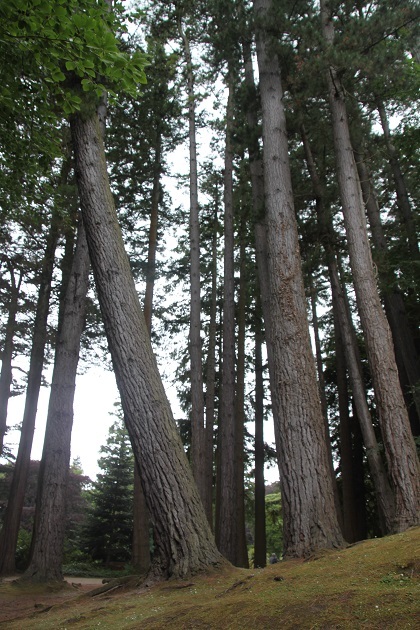 We strolled through Tower Valley with its magnificent trees – over 250 varieties planted over the years. Son headed straight for the Pepperpot Tower and climbed to the top. It is quaint and quirky, apparently modeled on a pepper pot from Lord Powerscourt’s dining table. He was an avid fan of the scouting movement and encouraged troops to camp in the grounds. He stood at the top of the tower to survey the scout camps. We loved the Japanese Garden, found a pagoda and a trickling stream under some lovely Japanese bridges. 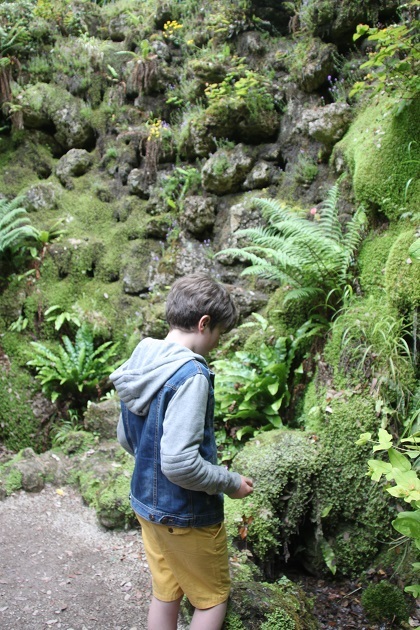 Son was intrigued by the grotto. It dates back to 1740 and is made from fossilized spaghnum moss. The sound of the water trickling down those moss covered walls was hypnotizing. The Pet Cemetery was another interesting place and all the headstones had personal inscriptions. 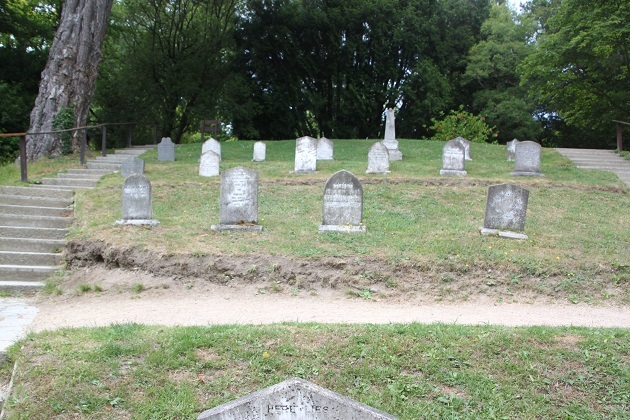 The family seemed to have a variety of well loved pets which were buried here including several ponies and a Jersey cow. 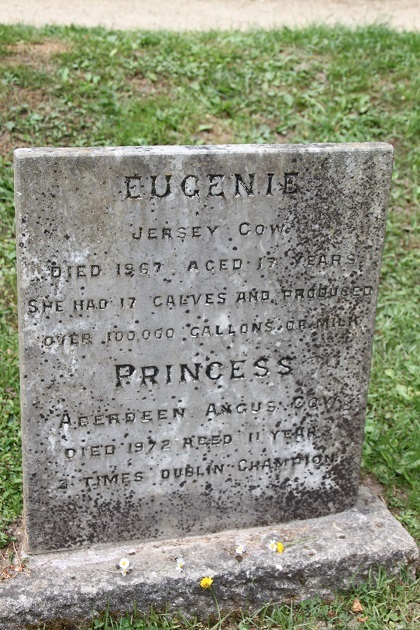 We thoroughly enjoyed reading all the inscriptions in this, the largest pet cemetery in Ireland. 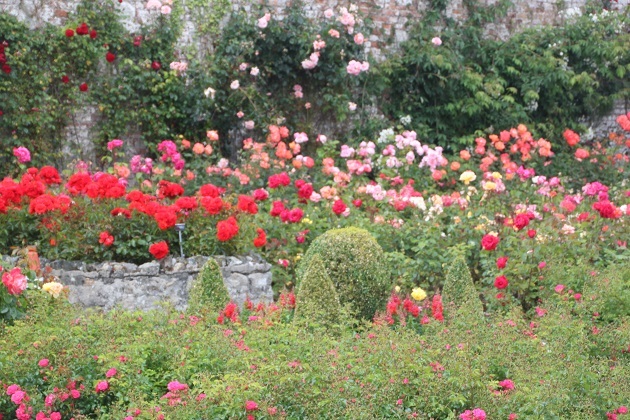 Back up to the mansion via a wonderful rose garden and we had finished our garden explorations. A lovely afternoon in a gorgeous setting. i love that pepperpot tower! It reminds me of the towers in the gardens of Quinta da Regaleira in Sintra, Portugal. We went to Sintra earlier this year but can you believe it Clare, the weather was so terrible – freezing cold and pouring rain that we explored the Pena Palace and spent the rest of the time there sheltering from the rain and trying to warm up again in a little cafe. So no more Sintra exploring, we didn’t manage to see these gardens (unfortunately) but maybe one day! Oh Joy, I’m so sorry that you didn’t get to see Sintra in all its glory! We went in February and were incredibly lucky with blue skies and sunshine. I really hope you get to see it again at some point – it was definitely one of the highlights of our Lisbon trip. We went in April and that was the only bad day of the entire week! Still, an excuse to go back for sure!! It is a really gorgeous place, the view from the Italian gardens is amazing isn’t it – we were lucky with the weather too! My favourite is the landscaped, manicured gardens in the foreground and wild nature in the background. What a view. It is just gorgeous – I loved the contrast between those two things as well! I love places that have lots of history! So pretty!!! We do too – this one had plenty of history and then those gorgeous gardens, a lovely afternoon!! Thanks Denzil!! It was intriguing – we were enthralled! 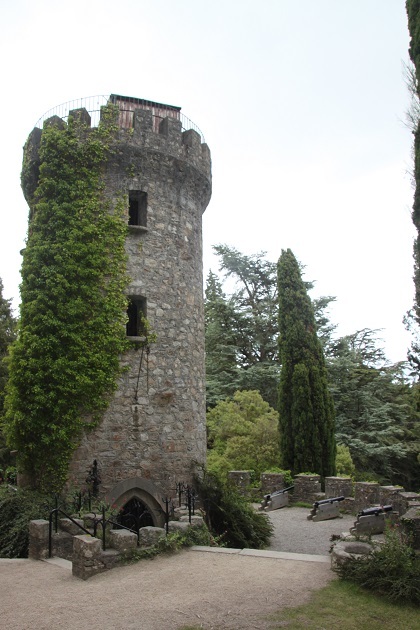 I’ve read about Powerscourt but have never visited so it was very interesting to read your post. Love the gardens and the Pepperpot tower. The gardens are stunning and that view from the front of the house over the Italian gardens to the mountain is just wonderful. We loved the Pepperpot Tower too and the story behind it! This looks lovely! Must put it on my ‘must visit’ list! Thanks for sharing. It’s a lovely part of Ireland with loads more things that are great for families to see and do in the area as well! Joy, the gardens are gorgeous, but that first view with the mountain as a backdrop is spectacular! 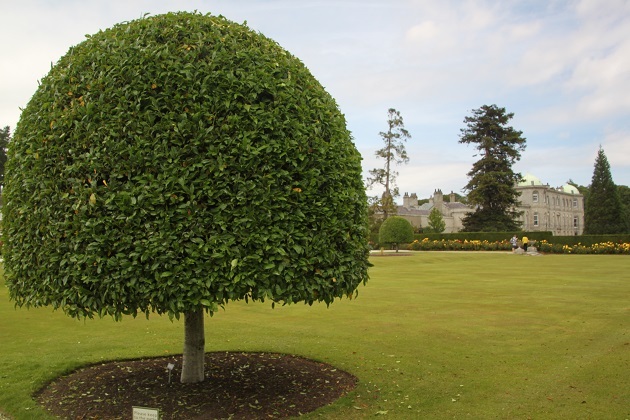 That was my favourite part of Powerscourt Pam – those manicured gardens and that wild and rugged mountain – nature at her finest to set it all off in the background. Love the photos and write-up. I’m amazed at the areas you cover and how you provide excellent insight. Thank you!! 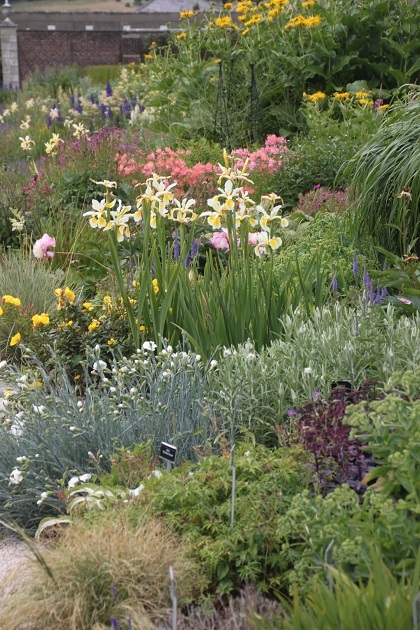 This was a great place to visit – words and pictures couldn’t do those wonderful gardens credit but hopefully it gives a little flavour of what it is like. We were lucky with the weather on our visit Shirley – this whole trip to Wicklow, whilst not entirely warm but we did have blue skies and sunshine mostly. What a shame you didn’t see the mountain with the mist – it truly is such a beautiful view. What a lovely place though to spend time before a long flight! Thanks to you I am putting this part of Ireland on my to do list. We only had a couple of nights there but still managed to find loads to see and do – I’m sure we only barely scratched the surface! I can’t decide if I like it when they repurpose castles, it’s good they’re being used but it’s sad to see them so commercialized. I suppose it’s better than being in disrepair. Lovely photos, the gardens look like a great place to spend an afternoon. The gardens were amazing, so gorgeous and so many different things to see and explore. I feel exactly like that about castles – this place was just like a big shopping centre, lovely facade but a real shame to see it like this – I thought! We went to Glendalough but not Powerscourt and your photos make me regret not going! Oh, well–I guess we’ll need another trip to Ireland! Sometimes I don’t actually feel too bad if we have to miss a place out on a trip – it always means an excuse to go back! 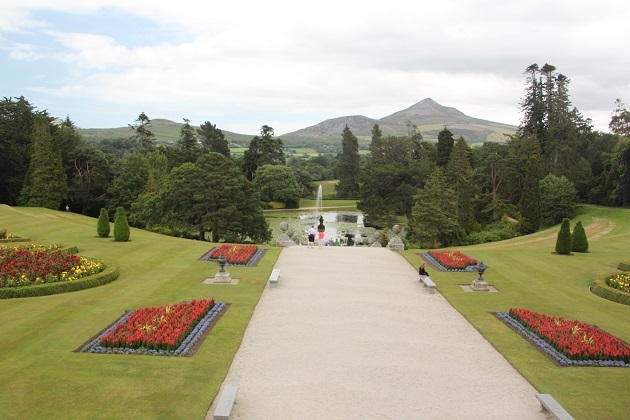 Powerscourt is definitely worth that excuse – if only for that view over Sugar Loaf Mountain! I just love it there. I have been a few times and would love to go back. It is one of those places you could visit in each season and still not see everything. I only wish you could stay in the house/castle. It is very commercial these days but I love it nonetheless. We were there late summer and I completely agree, to see it in the different seasons would be just wonderful. Went past May touring for 27 days. Wonderful experience. That sounds like a great amount of time to see a lot! It was quite a trip. Lots of memories. Stunning, Joy! 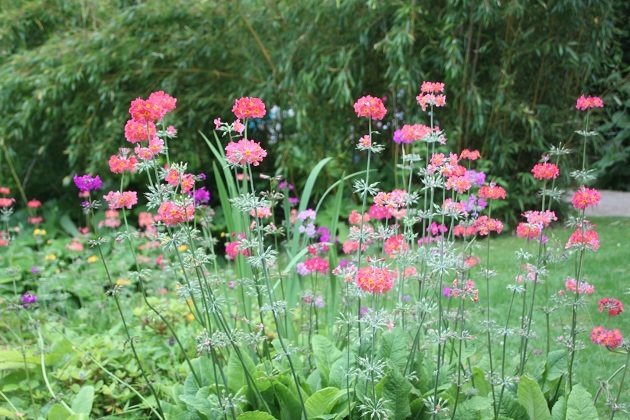 I am such a lover of gardens too. 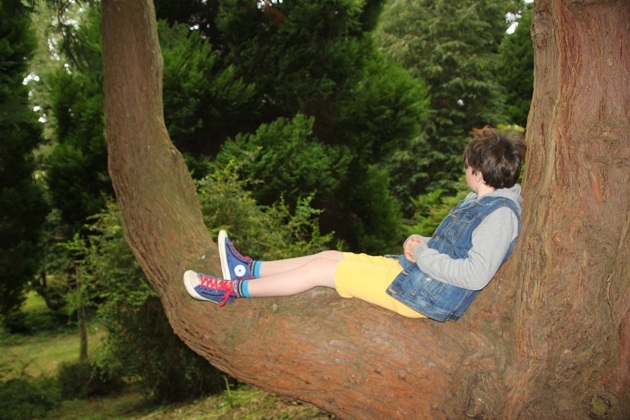 Great pic of your son in the tree and I liked the bit about the boys leaving with purchases, not you :). They dragged their heels about going into the shops and left laden down with bags – typical!! What a very cool looking place…peaceful and serene. Or so it looks. It was George – the car park and shops were manic, the gardens were empty, don’t get that but it suited us down to the ground! We loved the gardens here because they were so diverse Rosemary, all very different and all with various quirks and interesting things. Our son is not much of a fan of gardens but he loved exploring here! We might hit the Christmas markets this weekend, I’ve been holding out until December but our son is wearing me down…Hope all is well with you too and that your weekend will be a great one! Christmas markets sound wonderful Joy – I am determined to come over for a visit at this time of year at some point. It’s not quite the same when it’s warm though I have just ordered the turkey, ham and real Christmas tree!! It’s gone really hot all of a sudden so planning a relaxing weekend. Enjoy the markets!